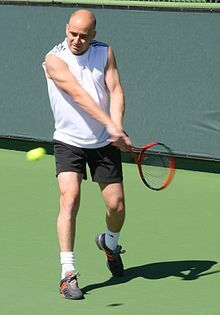 Andre Kirk Agassi (/ˈɑːndreɪ ˈæɡəsi/; born Aprile 29, 1970, in Las Vegas, Nevada) is an American retired professional tennis player an umwhile Warld No. 1, who wis ane o the gemme's maist dominant players frar the early 1990s tae the mid-2000s. ↑ Finn, Robin (July 10, 1993). "TENNIS; Agassi Has Streisand But Loses Bollettieri". The New York Times. Retrieved July 5, 2014. ↑ "Bio:Andre Agassi". Biography Channel. Retrieved 27 January 2011.